A video of Iranian protestors dragging what appear to be dead or injured bodies of fellow protestors off the streets has emerged, as Iran entered its sixth day of protests in a country that is increasingly growing in unrest that is expected only to fester, as larger-scale protests are possibly being planned for Friday. “We are coming to stop the [Western] protests. Stop rebelling… it’s dangerous [for you],” he says, according to the translation. The Iranian government considers protestors to be foreign agents, hence why the protests themselves are considered Western in nature. The protests began on Thursday in one city in eastern Iran over extreme price increases of everyday grocery items, and they have since turned into a nationwide movement that is beginning to call for a regime change. Grave violence has broken out, and at least 20 are now dead as the protests continue to spread across Iran. Many people are finding ways around the partial blackout. 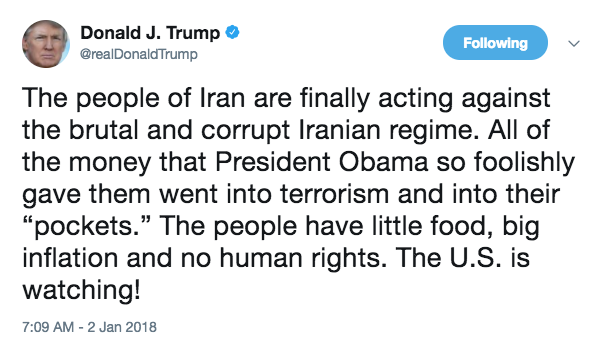 President Trump and the White House have come out in support of the protestors, and they have criticized the Iranian government for sponsoring terrorist groups around the Middle East. Trump also warned that he and the United States are watching for human rights violations. “When we asked where the money was spent, they would say: ‘It’s none of your business. You gave us the money. Goodbye! We will spend it anywhere we want,'” he added. The protests started Thursday in Iran’s second largest city, Mashhad, which is one of Iran’s holiest places, due to the country’s economic policies, high inflation, unemployment and economic inequality. The protests then spread to more cities and the message turned more toward regime change. The protests have also now formed in Tehran, the capital, and are gaining strength there. These videos are just a small sampling of what is coming out of the country.